The sticks are injection-molded, virtually indestructible high impact plastic, and the 12’’ diameter black rubber bases provide uncompromised stability. These sticks can rest in notched disc cones, support hurdle sets, speed rings, and are the building blocks for infinite creative uses. 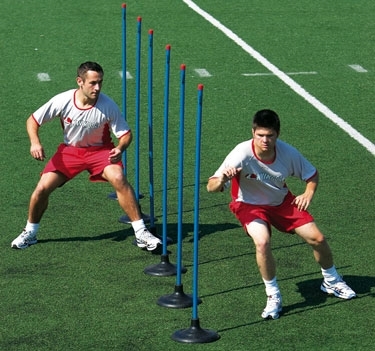 Creative drills and exercised invent themselves when coaching accessories are abundant on the training ground. Our Kwik Goal Premier Coaching Sticks neatly stand upright with included sturdy rubber bases. Stability without a stake on any surface—natural, artificial, or indoor.Set of 6.